In the Cleveland neighborhood of Collinwood, the nonprofit Northeast Shores Development Corporation has received a $1 million grant from the Kresge Foundation in support of a larger project known as the Waterloo Arts and Entertainment District. Most of this grant will go toward permanent improvements: creating a ceramics co-op studio, further developing artists’ live-work spaces, and converting vacant spaces into homes for artists. But a portion of the grant will support temporary programming aimed at keeping the district open—and lively—during the construction phase. Kresge has made creative placemaking grants in other cities. What’s interesting about the grant in Cleveland is that some of the funds will be used to attract visitors to the area over the next year, in the midst of ongoing construction and streetscape beautification work. Better still, those who might expect to see a downturn in business during the construction period are being invited to participate in the campaign to bring people into the neighborhood. Local businesses can submit funding requests to host events, such as pop-up concerts or art exhibits, community-building or networking evenings. Northeast Shores will determine which projects to fund and then will promote the events. 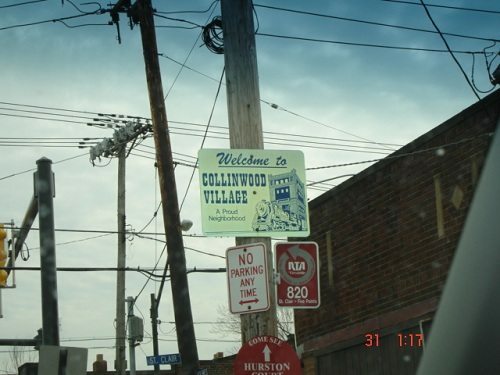 In addition to sending a message to the people of Cleveland that the Collinwood neighborhood is open for business during construction, the special events supported by the grant should help foster alliances between existing residents/merchants and a new wave of artists who will soon be making their homes there.